This Persistence Market Research report examines the global pharmaceutical excipients market for the period 2017-2021. The primary objective of the report is to offer insights into the developments in the pharmaceutical excipients market that are significantly transforming global businesses and enterprises. The pharmaceutical excipients market report begins with an overview of the pharmaceutical excipients process and analysis about why excipients are needed in the manufacturing of drugs. This section includes identifying the key functions of excipients and the respective considerations in each segment for appropriate sizing of the market. The following section underlines factors influencing the growth of the pharmaceutical excipients market currently, along with details of the key trends, drivers, restraints, opportunities, and an analysis of impacts expected to be created by each of the drivers and restraints over the forecast period. Impact analysis of the key regional growth drivers and restraints have been assessed based on a weighted average factor model along with key region-specific trends. This has been included in the pharmaceutical excipients market report to better equip clients with information and hidden insights. At the end of the report, Persistence Market Research has provided an exclusive section on key strategic considerations for a new entrant planning to enter the pharmaceutical excipient in near term. The section highlights key requirements, which should be used to assess the quality of excipients produced, to better capture higher market share and emerge sustainably profitable over the long term. The global pharmaceutical excipients market is analyzed by chemistry type (i.e. source of origin), segmented into plant-based, animal-based, mineral-based and synthetically derived excipients. Based on functionality, the market has been segmented into binders (binders, coatings and fillers), glidents, diluents, disintegrants and others (solvents, co-solvents, anti-microbial agents, lubricants, colorants, emulsifiers, and humectants). By application type, the market has been segmented into oral, topical, parenteral formulations and others, which include suppositories, intra-muscular, ophthalmic preparations in terms of value, over the forecast period. A detailed analysis of every segment in terms of market size, Y-o-Y growth rate, absolute dollar opportunity, market attractive index, and BPS analysis has been provided along with appropriate rationale. The next section of the report highlights the growth trends witnessed in the pharmaceutical excipients market, by region. It provides a market outlook for 2017-2021 and sets the forecast within the context of the pharmaceutical excipients market. The study discusses key regional trends contributing to the growth of the pharmaceutical excipients market worldwide, as well as analyses the extent to which the corresponding drivers are influencing this market in each region currently. Key regions assessed in this report include North America, Latin America, Europe, Asia-Pacific, and the MEA. Analysis by chemistry type, application type, functionalities and regions helps in evaluating the present scenario and growth prospects of the pharmaceutical excipients market for the period 2017 - 2021. We have considered 2016 as the base year and provided data for the forecast period. To ascertain the pharmaceutical excipients market size, we have also considered key quality assessment parameters that should be considered while judging the quality and grading of excipients. The forecast presented here assesses the total revenue generated, by value, across the pharmaceutical excipients market. In order to offer an accurate forecast, we started by sizing the current market, which forms the basis of how the pharmaceutical excipients market is expected to develop in the future. Given the characteristics of the market, we triangulated the outcome of the three different types of analysis, based on the supply side, downstream industry demand, and the economic envelope. In addition, it is imperative to note that in an ever-fluctuating global economy, we not only conduct forecasts in terms of CAGR but also analyze based on key parameters, such as Year-on-Year (Y-o-Y) growth rates, to understand the predictability of the market and to identify the right opportunities in the pharmaceutical excipients market. The pharmaceutical excipients segments have been analyzed in terms of the Basis Point Share (BPS) to understand individual segment’s relative contributions to market growth. This detailed level of information is important for identification of various key trends in the pharmaceutical excipients market. Another key feature of this report is the analysis of key segments in terms of absolute dollar opportunity. This is traditionally overlooked while forecasting the market. However, absolute dollar opportunity is critical for assessing the level of opportunity that a provider can look to achieve, as well as to identify potential resources from a sales and delivery perspective, in the pharmaceutical excipients market. To understand key growth areas of pharmaceutical excipients in the near future, Persistence Market Research developed the pharmaceutical excipients market’s ‘Attractiveness Index’, which has been represented by for all four categories, chemistry type, application type, functionalities and regions. The resulting index is expected to help providers identify real market opportunities. In the final section of the report, information related to the pharmaceutical excipients ‘Strategic Recommendation’ is included to provide report companies with insights required while entering a specific segment or a country to strengthen their revenue footprints in the pharmaceutical excipients market and to differentiate themselves. Key categories of providers covered in the report are pharmaceutical excipients manufacturers. Detailed company profiles have been primarily designed to provide clients with an objective and detailed comparative assessment of key providers specific to a key market segment in the pharmaceutical excipients value chain and the potential players with respect to the same. Report audiences can gain segment-specific vendor insights to identify and evaluate key competitors based on the in-depth assessment of their capabilities and success in the pharmaceutical excipients marketplace. Detailed profiles of the providers also include company-specific long-term and short-term strategies, key offerings, and recent developments in the pharmaceutical excipients market. The world has been witnessing rising demand for medicines, led by an increase in the number of chronic diseases, greater awareness towards physical well-being, and rising incidence of lifestyle diseases such as diabetes and obesity-related disorders. This has been fueling demand for and production of drugs and thus excipients. Excipients are believed to aid active pharmaceutical ingredients achieve better functionalities such as longer shelf-life, and also render competitive advantage in formulation. Industry experts have noted that over the last three years there has been increasing demand for cheaper quality excipients from emerging economies in Asia Pacific and East Africa regions due to increased requirement in the local drug manufacturing industry. However, the trend is the opposite to the situation currently in developed economies with sophisticated manufacturing practices, where demand for superior quality excipients is increasing, but at a lower rate than that in emerging economies. Government initiatives in various countries is driving revenues derived from healthcare services and drug manufacturing in emerging economies such as India, China, Brazil, Kenya, and Nigeria are expected to contribute to increasing demand for excipients over the assessment period. Demand for oral solid drug formulations has been witnessing a steady increase over the past few years owing to ease of consumption by patient classes, including children. Oral dosage forms generally require more amount of excipients than other forms during the drug manufacturing process and is being promoted due to adoption of increased patient-centricity approaches by drug manufacturers. For example, over 50% of patients find it difficult to swallow conventional hard solid tablets. This has prompted drug companies to devise more innovative solid oral product forms such as orally disintegrating granules (ODGs), effervescent tablets, lozenges, instant drinks, and chewable tablets. This is expected to create substantial demand for excipients in the near future. Lack of separate guidelines for manufacturing and approval of excipients is deterring R&D initiatives related to novel excipients. Under the present regulatory scenario, if a new drug approval (NDA) fails, the excipient also fails even if it is not due to anything related to the excipient. Furthermore, clinical trial data from that failed excipient is not usable. This leads to major financial loss on the part of both the drug and the excipient manufacturer. The cost and time frame to develop novel excipients under proper regulatory compliances are both uneconomical for manufacturers, thus limiting the outlook for getting a novel excipient approved. High incidence of chronic diseases and increasing tendency for consuming oral formulations are factors expected to fuel demand for plant-based pharmaceutical excipients over the forecast period. Synthetic excipients is currently the most attractive segment in the market, followed by natural plant-based excipient segment. Manufacturing of drugs using plant-based excipients is easier as compared of manufacturing of drugs using synthetic excipients, as the latter are mostly complex in nature. Also, excipients sourced from plants include sugars (carbohydrates) and thus, find wide application in taste-masking of drugs. Natural excipients are primarily used in oral formulations as binders and fillers. 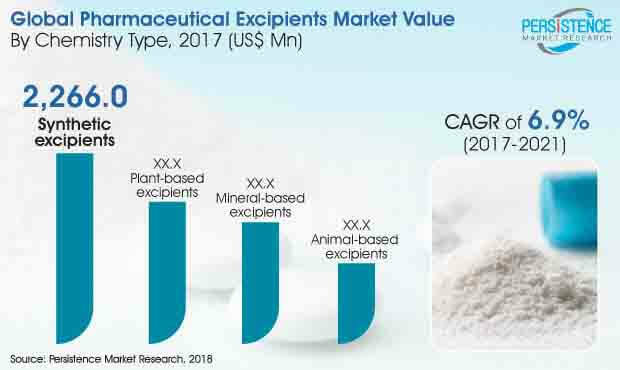 Synthetic excipient type segment has been estimated to witness an increase in value from US$ 2,266 Mn in 2017 to US$ 3,018.4 Mn by 2021, registering a robust CAGR over the forecast period.